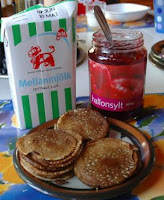 Today we ate Swedish mini-pancakes, plättar, AND fresh "strömming" that my daughter go to fish earlier in the day. Now is this Swedish summer or what!? I wonder if you can get a "plätt-lagg" in the US... not really something I would want to carry in a suitcase... but it sure is yummy with plättar! Oh yum that looks lovely! Do they taste like sweet crepes? I miss Blini's (italian i think)from england which look like mini pancakes but people tend to have them with savoury things and dip them in sour cream or guacamole. Jag köpte en på Sur La Table. Billig, gjutjärn. Antagligen tänkt för blinier. Jodå, plättar (och plättjärn) finns även i USA - leta efter ett järn för Silver Dollar pancakes. Ser så svenskt och härligt sommrigt ut. Mums!